2017-18 Panini Mosaic Prizm Basketball sees the popular brand return but this time as an online exclusive. Originally conceived for 2016-17 as a make-good for the Replay fiasco, the 2017-18 edition is a full release for the brand, albeit direct to consumers via the online Panini America Store for $100 per box starting March 14. 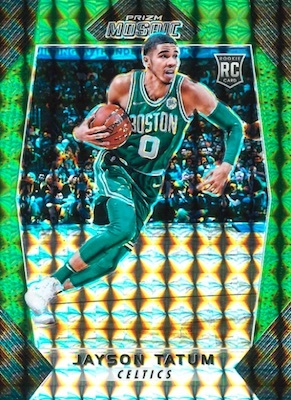 Clearly distinguished from the main Prizm line due to the unique pattern, the 2017-18 Panini Mosaic Prizm Basketball checklist works with a 100-card base set led by top 2017 rookies. Combining to average nine per box, more limited options include Blue, Green, Orange, Red, Purple (#/99), Camo (#/25), Gold (#/10) and Black (1/1) parallels. Other than the base cards and parallels, 2017-18 Panini Mosaic Prizm Basketball only has numbered autographs. 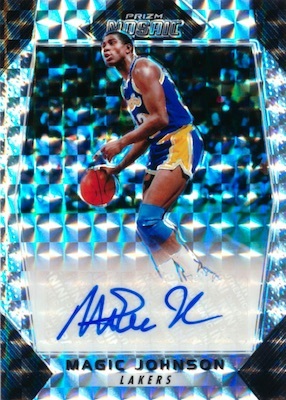 With a print run of 99 or less, the Autograph set features legends like Kobe Bryant and key rookies such as Donovan Mitchell. There are also Camo (#/25), Gold (#/10) and Black (1/1) parallels. Although exact odds weren't provided for the signed cards, each 2017-18 Panini Mosaic Prizm Basketball hobby box averages one autograph or one numbered base parallel. 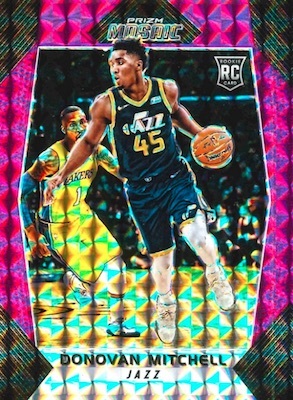 2017-18 Prizm Silver Mosaic Donovan Mitchell RC Rookie Card Jazz NBA Invest Now! PARALLEL CARDS: Green, Red, Blue, Orange, Purple #/99, Camo #/25, Gold #/10, Black 1/1. PARALLEL CARDS: Camo #/25, Gold #/10, Black 1/1. KARL-ANTHONY TOWNS 2017 18 PANINI PRIZM MOSAIC AUTOGRAPH #44 99 -TIMBERWOLVES!! 1 auto or #’d parallel?? Is this a joke??? Love the design. In it for the autos. Are the parallels listed less rare from left to right? Should be most common to rarest, from left to right. As no indication was given for rarity, this is based solely on what has shown up on eBay so it’s not set in stone. They are basically the high end version of prizm series with shorter print, higher price tag, and nicer product overall. Only complaint is not low frequency of major hits in these boxes. Love this stuff very fun to rip open! 2017 18 Panini PRIZM MOSAIC Basketball Factory Sealed HOBBY BOX! ON FIRE! 2017-18' Panini Prizm Mosaic Basketball Hobby Box + Free Bonus Item You Choose. !